I got an email this morning from Fran, of Liz and Fran fame, and she informed me that they were having a sale, at that very moment, at their house. Aren't I the lucky one? The answer is a resounding YES. For more info on Liz and Fran, peruse through Talking Trash's blog. She has covered them in the bomb.com and other great posts. I rushed over and loaded up a few nice pieces. 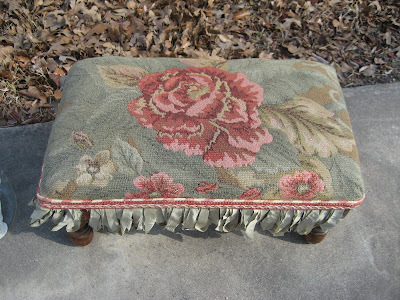 I love this footstool. Don't you? 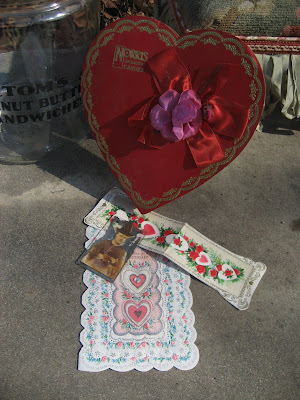 I thought the reds would look good in a Valentine display. So, I scooped em up. 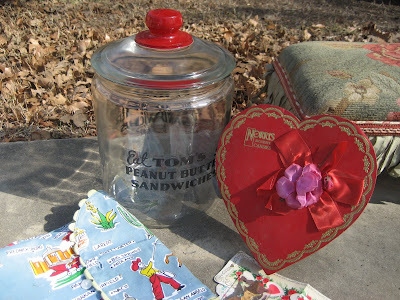 The jar says "Eat Tom's Peanut Butter Sandwiches 5 cents". We are turning the store upside down tomorrow. I'll take pictures along the way. Resetting for Valentine's Day should be fun. If you see something you want now, holler. Otherwise, it will go into a vignette tomorrow. It's all for sale, my friends. 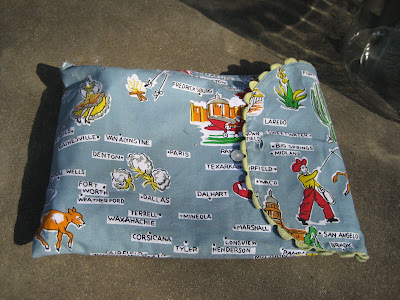 This wonderful cloth case houses a wonderful table cloth, with a Texas map and Texas stuff all over it! Click it to go large, and I'll be glad to forward pictures of the table cloth if you would like. Would ya check out the white wall inset thingy bob? 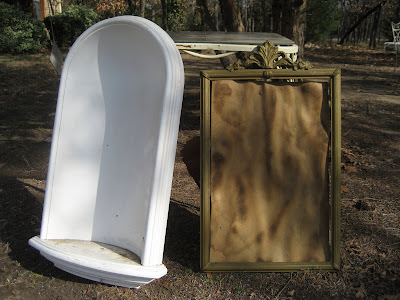 Wouldn't it be perfect set into a wall, displaying a big concrete or plaster statue? And the frame was a bonus piece for me! Isn't it great? Tonight at midnight is the deadline for my giveaway. Sign up now or forever hold your peace. One nice comment on blog 99 or 100 will suffice. I am having more fun reading the new folks' blogs. Thanks, everyone for your responses, following, blogs and referrals! Love that wall niche! So cool! Good haul today, Mindy! Love the mirror! Does that mean more reflection time in the bathroom??? Wow great finds. I love the eat Tom's jar. Cool. The frame is also cool. FIxed up it will look great! Great frame and I like the little footstool too. I have a little one in my daughter's room. Wow, I love your finds!! 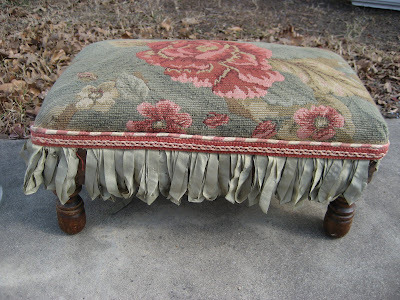 That footstool is to dye for!! Love that Jar! Things like these make any home homier. Hi, Mindy! I am sooooo disappointed I missed the drawing for the book! Now I'm going to have to figure out some other way to get this house clean. 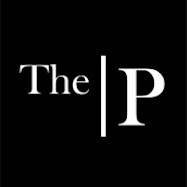 I love your pictures, and I think I would love to visit your store.